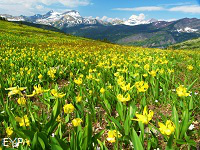 Goat Haunt Montana is known as "The Gateway to the Northern Wilderness of Glacier Park". 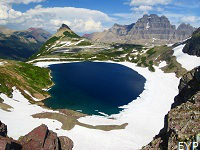 The iconic Goat Haunt Area of Glacier National Park provides hikers access to some of the most remote and scenic landscapes in all of North America as well as some of the best hiking trails on the continent. Goat Haunt allows Glacier Park hikers and overnight backpacking adventurers to have access to the famous Boulder Pass Trail, Stoney Indian Pass Trail, Waterton Valley Trail and Fifty Mountain along the Northern Highline Trail, all of which are world class Glacier Park hikes located in the northern wilderness. Goat Haunt Montana in Glacier National Park. 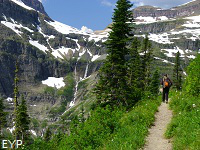 These world class Glacier Park trails take hikers into literally some of the most beautiful and remote country we've ever seen, and we are thankful that Goat Haunt is there to provide access to all of these great Glacier Park hiking opportunities for those folks like us who love to backpack and explore these rarely visited wilderness areas of Glacier Park. 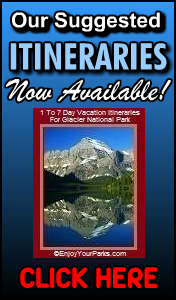 In addition to being "The Gateway to the Northern Wilderness of Glacier Park", Goat Haunt in Glacier Park also is an important EXIT for these Glacier Park hikes. Hikers starting out at Kintla Lake, or Logan Pass, or Chief Mountain Customs Trailhead, or Bowman Lake, all end up at Goat Haunt after spending many days hiking through these pristine areas of the Northern Wilderness of Glacier Park. Where is Goat Haunt Montana? Goat Haunt Montana is about 8 miles south of Waterton Township, and the only practical way of getting there is to take the Waterton Lake Tour Boat. 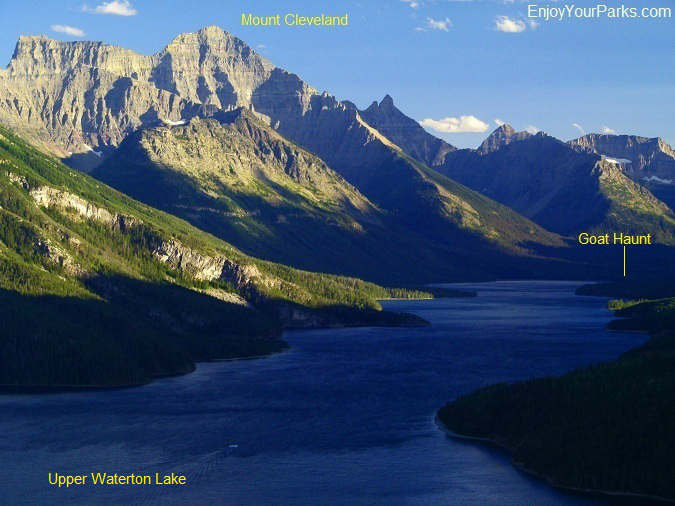 Halfway through the boat ride you will cross the Canadian Border back into the United States and Glacier National Park. 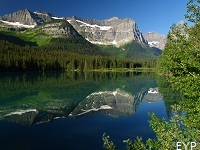 Goat Haunt Montana is located near the northern border of Glacier National Park, nested at the southern tip of Upper Waterton Lake. 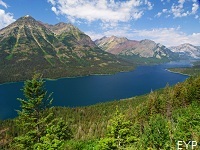 Across the northern border of Glacier Park is Canada and Waterton Lakes National Park. Goat Haunt is inter-connected with Waterton Lakes National Park because it shares the massive Upper Waterton Lake, and is the only place to come in and out of the United States and Canada while in the interior of either of these great parks. 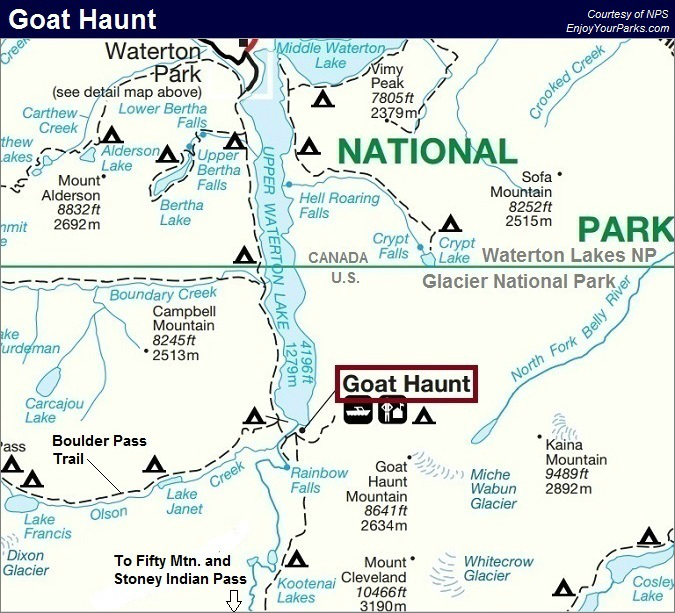 Goat Haunt is really the center of the Glacier- Waterton International Peace Park with regard to the International cooperative efforts between these two parks, because Goat Haunt is where hikers come into Waterton Lakes National Park from Glacier Park, and vice versa. 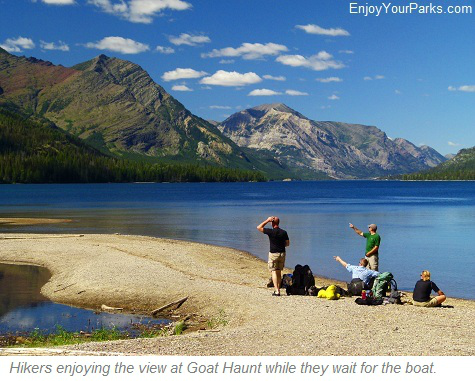 In other words, Goat Haunt is the true "connection" between Glacier Park and Waterton Lakes National Park, thus truly creating an international cooperative effort that you can see with your own eyes. 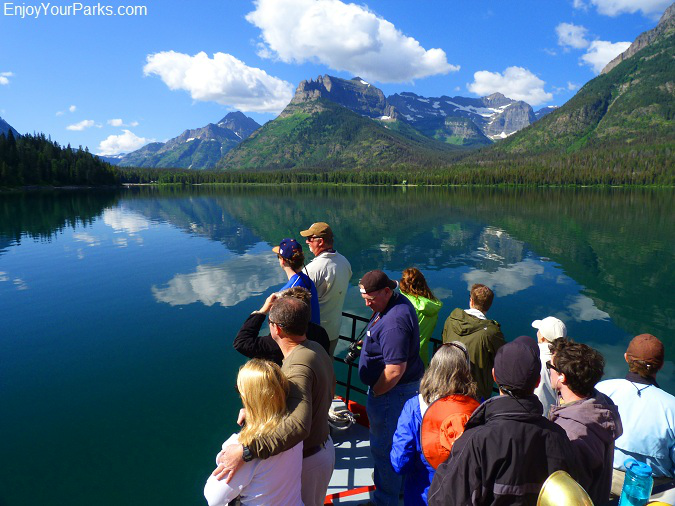 Visitors enjoying a gorgeous day during their Waterton Lake Boat Tour, on their way to Goat Haunt in Glacier National Park. 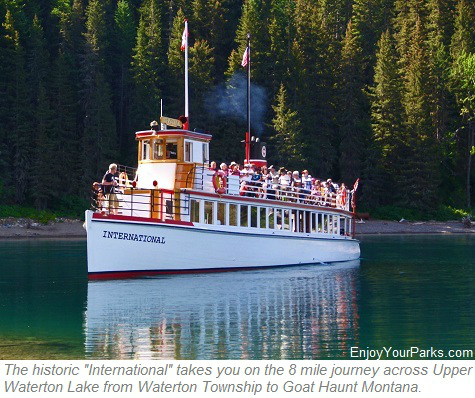 To get to Goat Haunt, you must take an 8 mile boat ride on Upper Waterton Lake, starting at the town of Waterton. This boat ride in itself is a wonderful treat because not only is it a way to get to Goat Haunt, but it is also a fantastic tour of Upper Waterton Lake. 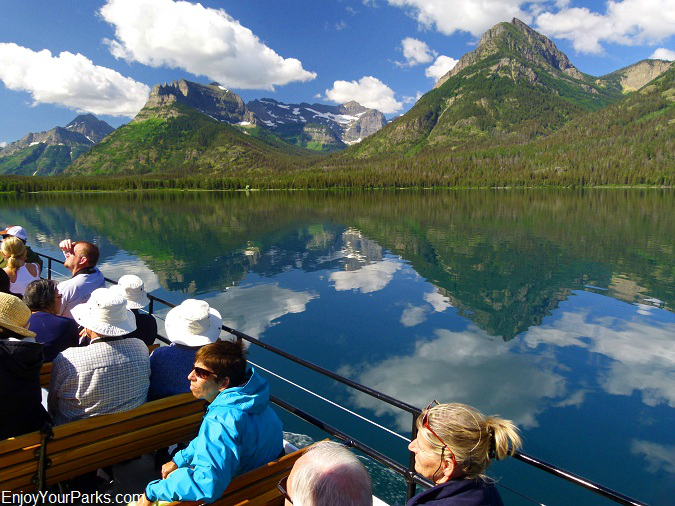 In fact, the Waterton Lake Boat Tour is one of the most popular attractions in Waterton Lake National Park, and we highly recommend that you take this entertaining, informative and incredibly scenic tour while visiting Waterton Lakes National Park, whether you plan on hiking or not. There are two large tour boats that take visitors to and from Goat Haunt, and these tour boats each run several times a day. 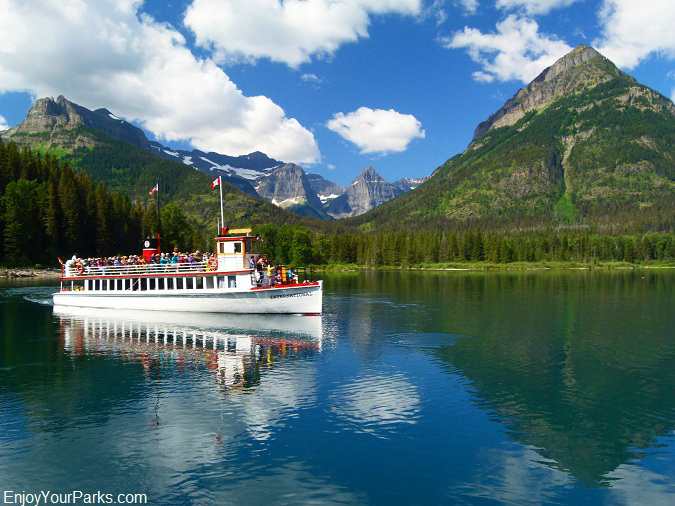 One of the most famous Waterton Lake Tour Boat is the historic "International". This grand old wooden ship was built in 1927 and is certified by the U.S. Coast Guard every year. The International was built in the United States and is commissioned U.S. vessel. The other tour boat is the "Miss Waterton". This is a newer Canadian vessel is equally as sea worthy and certified each year by the Coast Guard. 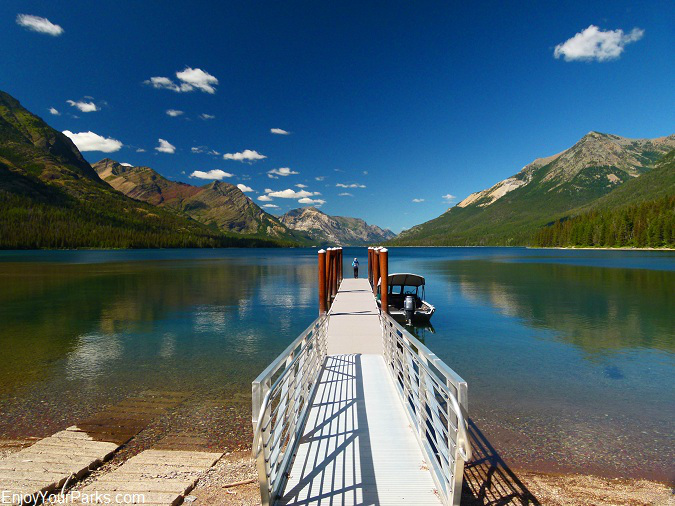 For more information on the Waterton Lake Boat Tour, click here. 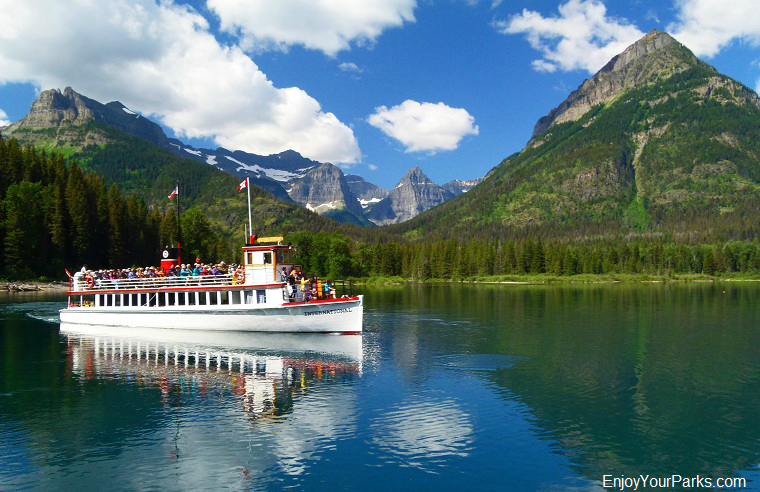 The historic boat "International" is getting close to Goat Haunt Montana in Glacier National Park. The Waterton Lake Boat Tour is extremely enjoyable, and really the only way to get to Goat Haunt... that is if you don't want to walk the Waterton Lake shoreline for 7 miles one way. 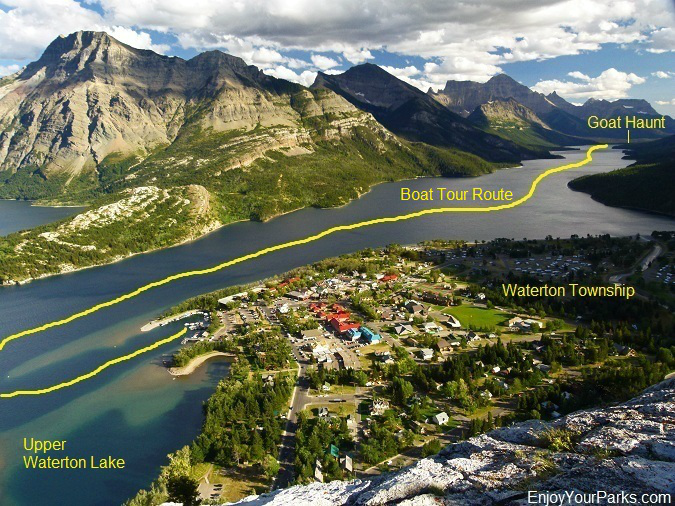 The tour boats work their way up Waterton Lake, showing you the interesting features of the area, and about halfway up the lake you will cross the International Boundary. Once you cross this boundary between the United States and Canada, you are back in the U.S. and back in Glacier National Park Montana. 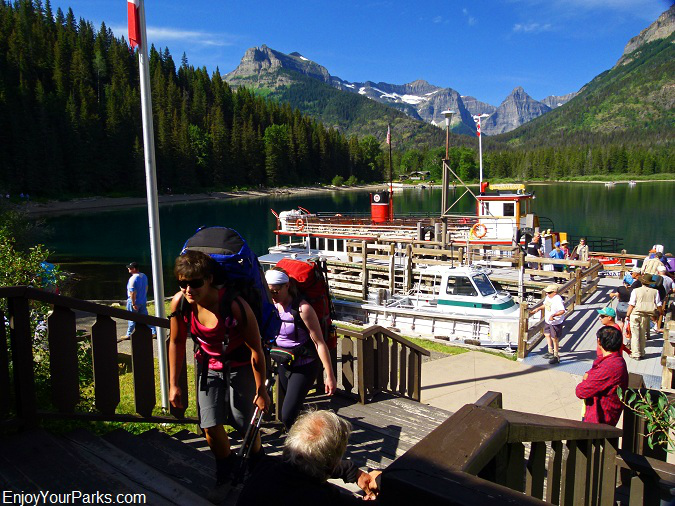 Once the Waterton Lake tour boats arrive at Goat Haunt, the passengers are allowed to leave the boat for about a half hour so they can explore the immediate Goat Haunt Area. The scenery surrounding is absolutely spectacular! 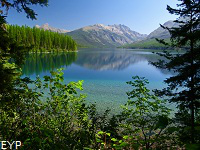 There is also a hiking trail called the Waterton Lake Trail that follows the west shore of Waterton Lake all the way from Waterton Township to Goat Haunt Montana, which is about 7 miles long. Most people choose to take the boat instead for obvious reasons. Visitors arriving at Goat Haunt Montana in Glacier Park. Goat Haunt Montana has several "faces" that are all interconnected and vitally important to this northern section of Glacier Park. Goat Haunt serves as a vital trailhead and gateway to the remote Northern Wilderness of Glacier Park, as well as an exit to all the Glacier Park backpackers who are finishing up their northern hikes in Glacier Park. Goat Haunt is also a "backcountry campground" for overnight backpacker, a ranger station, as well as an official international port of entry. 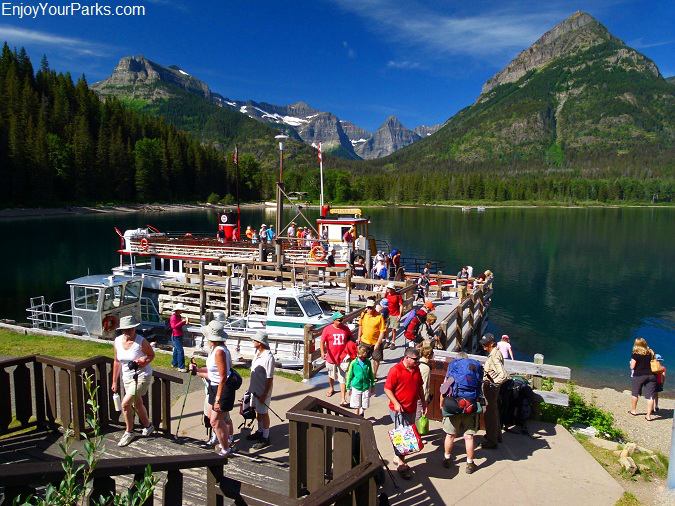 Goat Haunt Montana in Glacier Park is an official U.S. Class B Port of Entry. 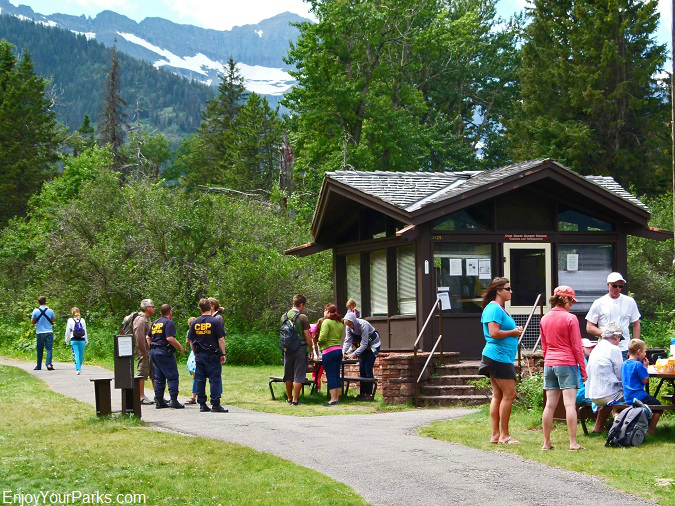 This means that all hikers entering Goat Haunt from their Glacier Park hikes in the northern wilderness, or all hikers that just got off the boat and are heading into the northern wilderness of Glacier Park will be carefully checked by U.S. Border Patrol Agents. All hikers MUST have proper documentation with them. All documents are required to be Western Hemisphere Travel Initiative (WHTI) compliant. 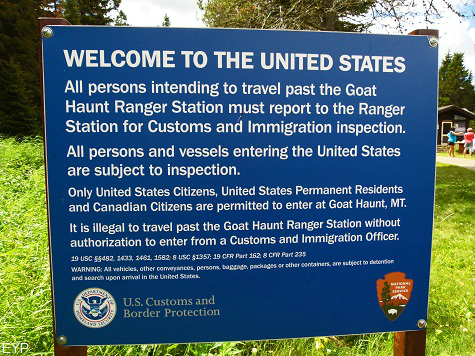 Only United States Citizens, United States Permanent Residents and Canadian Citizens are permitted to enter at Goat Haunt Montana. 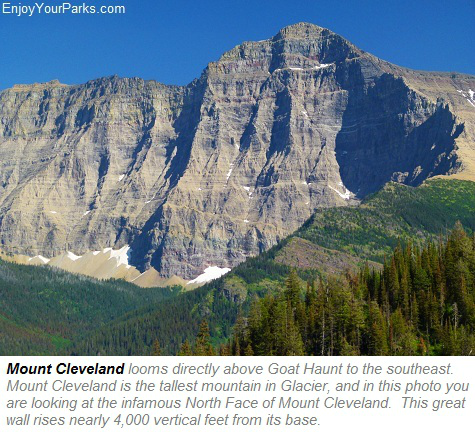 Goat Haunt is known as "The Gateway to the Northern Wilderness of Glacier Park", and rightly so. 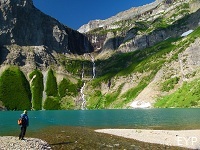 From the trailhead at Goat Haunt, hikers have access to some of the most incredible hikes in Glacier Park. 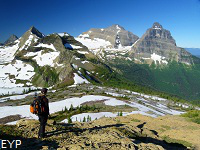 These world class hiking trails are among the best hikes in North America, and without question is our favorite overnight backpacking "playground" in all of Glacier Park. 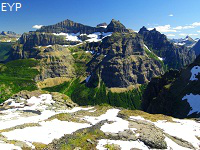 Mount Cleveland towers over the Goat Haunt Area in Glacier National Park. From the trailhead at Goat Haunt, hikers can access the famous Boulder Pass Trail, which includes Lake Janet, Lake Francis, Thunderbird Pond, Brown Pass, Hole In The Wall, Boulder Pass, Boulder Pass Overlook, Upper Kintla Lake and Kintla Lake. The trailhead at Goat Haunt also provides access to the Waterton River Valley Trail which includes the Kootenai Lakes area. 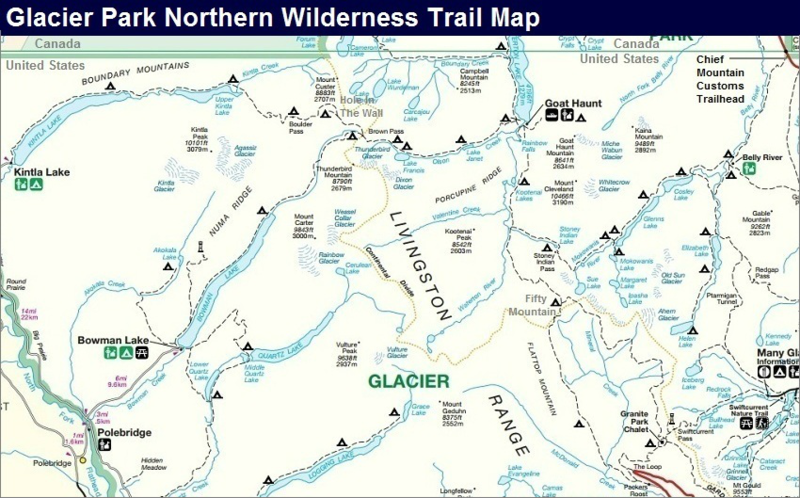 The Waterton Valley Trail then connects with the Northern Highline Trail, which includes the remote Fifty Mountain Area, Sue Lake Overlook, Ahern Pass, Granite Park Chalet and eventually Logan Pass. 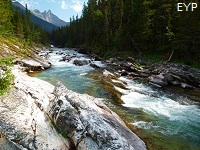 If you're interested in just a short day hike so you have time to catch the boat back to Waterton Township, then three ideal Glacier Park hikes await you at Goat Haunt. The Goat Haunt Overlook Overlook (1 mile one way and an 800 foot elevation gain), the Kootenai Lakes (2.5 miles one way) and Rainbow Falls (1 mile one way) are all great options to choose from. Click the links below to learn more about these short day hikes at Goat Haunt. All three of these hikes are short enough to enjoy and still catch the last boat back to Waterton Township. Overnight backpackers arriving at Goat Haunt Montana in Glacier National Park. In addition to being a U.S. Port of Entry and a major trailhead to all of the major northern hikes in Glacier Park, Goat Haunt Montana in Glacier Park is also a ranger station. The Goat Haunt Ranger Station is a permanent summer home for several backcountry rangers, maintenance workers and trailblazers. This allows rangers to help hikers in need, and to patrol the northern wilderness to make sure all is well. In front of the Goat Haunt Ranger Station, Border Patrol Agents will check your documentation before you can enter any Goat Haunt trail. The Goat Haunt Shelters are available for overnight backpackers who need them during their hike into the Northern Wilderness or upon their return to Goat Haunt. Many times hikers will come into Goat Haunt after the last tour boat has already left Goat Haunt for the day. These shelters really save the day when this occurs. Also, often times hikers will stay their first night in the Goat Haunt Shelters before they head into the Northern Wilderness of Glacier Park because there is no time to do otherwise. 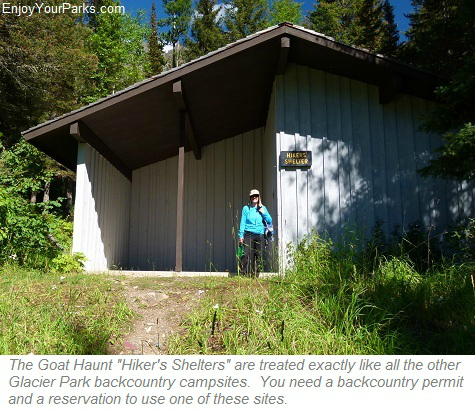 The Goat Haunt Shelters are treated exactly like any other Glacier Park backcountry campgrounds, which means you must have an overnight backpacking permit and must make reservations with the National Park Service prior to staying at these shelters. The shelters are basically a cement floor surrounded on three sides by walls and a ceiling. The floor space is large enough for a fairly large three to four man tent, or two smaller single man tents. There is also a place designated for cooking and hanging your food, just like any other Glacier Park backcountry campground. of the cooperation between Canada and the United States regarding this historic Peace Park. Without this agreement, Goat Haunt would be non existent because there would be no access to this wonderful area by boat. 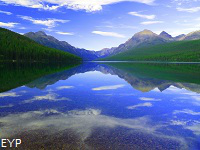 And by the way, in 1932 Waterton Lakes National Park and Glacier National Park became the first International Peace Park in the entire world, and since then many other countries have followed this example. 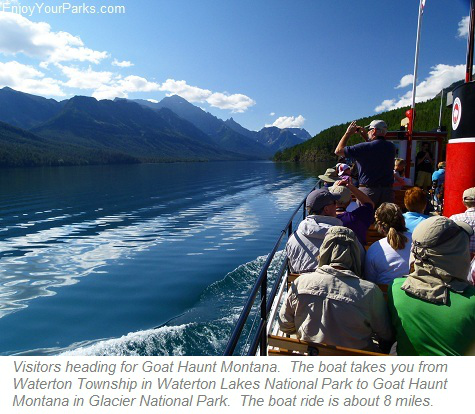 Goat Haunt truly is a special place for many reasons, and we highly recommend that you take the boat tour and visit this historic and beautiful area of Glacier Park. Goat Haunt Montana in Glacier Park is a very special place that opens the door to the remote Northern Wilderness of Glacier National Park. 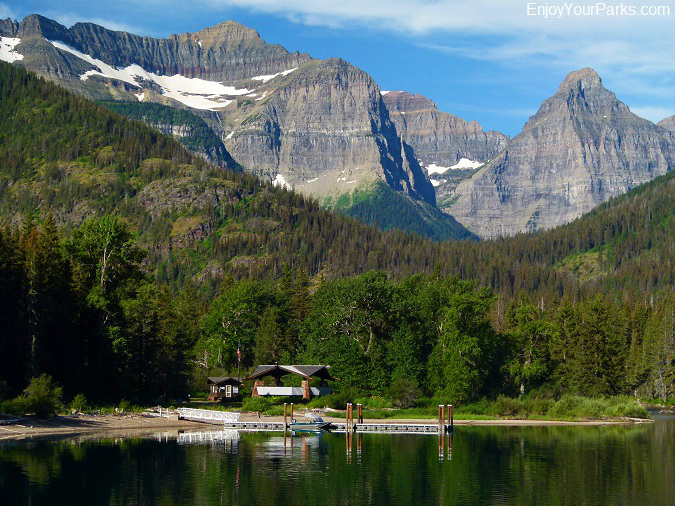 Without Goat Haunt, these world class Glacier Park hikes would not be possible. And even if you're not an overnight backpacker, Goat Haunt is still a great place to visit and enjoy, and the boat ride is absolutely wonderful!